Present at the inaugural tournament in 2015, when she struck gold in the copper mining region of Panagyurishte, Kasumi Ishikawa is the top seed in the Women’s Singles event at the forthcoming Seamaster 2018 ITTF World Tour, Asarel Bulgaria Open. Play commences on Thursday 16th August being preceded by a two day qualification tournament which starts on Tuesday 14th August. The winner three years ago, Kasumi Ishikawa has just claim to be regarded as the tournament’s most successful player. Additional to winning in 2015, she is both the Women’s Singles and Women’s Doubles defending champion; last year she won the latter in partnership with Mima Ito. 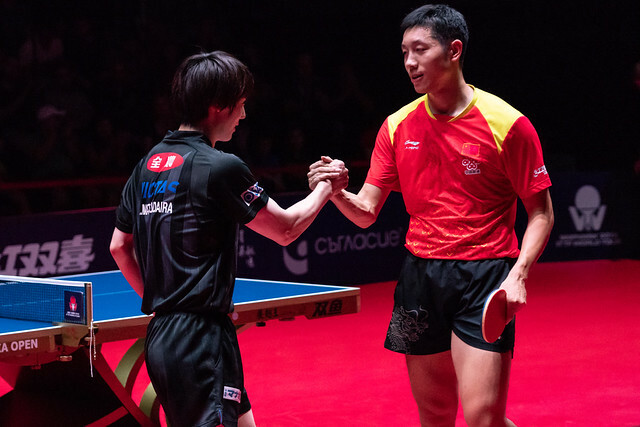 Notably that combination is maintained, although in recent times Mima Ito has partnered Hina Hayata; the duo currently head the Seamaster 2018 ITTF World Tour Women’s Doubles Standings. In Panagyurishte, Hina Hayata and Miu Hirano occupy the second seeded position with the leading three places all reserved by Japan. Honoka Hashimoto and Hitomi Sato reserve the top spot with Kasumi Ishikawa and Mima Ito being the no.3 seeds. Japan prominent in the Women’s Doubles event; it is the same in the Women’s Singles competition where they occupy seven of the top eight seeded places. Next in line to Kasumi Ishikawa is Mima Ito followed by Miu Hirano, Hitomi Sato and Hina Hayata; Miyu Kato and Saki Shibata complete the octet. At first glance, the evidence suggests that the tradition of the tournament will be maintained; always the Women’s Singles final has been an all-Japanese affair. In 2015 Kasumi Ishikawa beat Ai Fukuhara in the title decider; last year she overcame Mima Ito. Sandwiched in between in 2016, Yuka Ishigaki accounted for Misaki Morizono to claim the top prize. However, this year the one player amongst the top eight names who is not from the Land of the Rising Sun may just upset convention. China’s Ding Ning, the reigning Olympic and World champion, is the no.6 seed. Furthermore, by competing in Panagyurishte, Ding Ning will have achieved what the other leading names have already achieved; she will have met the minimum five appearance criteria to compete in the end of year Grand Finals. Currently she occupies the no.5 spot on the Women’s Singles Standings and could we see all top eight names on duty in Bulgaria amongst the 16 names invited to the Grand Finals? The lowest is Miyu Kato, presently in the no.19 spot; the rest are all above the cut-off line.